Comfort food: the theme of this week's #SundaySupper and a favorite kind of food for me to make. People gravitate towards chili, mac-n-cheese and soups and I get all kinds of giddy. This week I decided to make Ditalini Italian Soup. The classic Italian flavors of oregano, basil and garlic really lend themselves to making this dish great. Comfort food to me means a dish that brings you joy and reminds you of the place and time in which youfirst ate it. More often than not, I see comfort food as a dish you want me to make time and time again, that's easy and a joy to cook, and also a pleasure to serve to others. I created this soup a long while ago and cook it on a regular basis for our household of two. I like to make my own meatballs for the dish when I have the time, but the reason it's such a go-to meal for me is because it can be made with no fuss and almost no clean up. This is where the frozen meatballs come into play and, more often than not, this is how I make the soup, so frozen meatballs is the ingredient that made it into the recipe. After all, I have to leave my fabulous meatball recipe for another time, right? Heat the olive oil in a medium saucepan over medium-high heat. Add the onions and saute until translucent, about 3 minutes, adding a little bit of salt. Add the garlic to the pan and saute together with the onions for 1 minute. Then add the meatballs, can of diced tomatoes, chicken broth, tomato paste, Italian seasoning, red pepper flakes and dashes of hot sauce. Simmer for 15 minutes. While still simmering, add the Parmesan cheese and Ditalini pasta and continue to simmer another 15 minutes. Remove pan from stove top, add dried oregano and basil. I like to also add some freshly grated Pecorino Romano, but that's just preference. Ditalini Italian Soup by Mangiamo! I love frozen meatballs too. Get help anywhere you can. Your soup looks wonderful. It is one of my favorites. wow! just wow! that is a bowl of comfort right there! This soup certainly looks like a bowl of comfort. Beautiful photos too! This sounds amazing! The flavors sound huge and comforting! Oh my your soup looks so good! I've never used frozen meatballs before but I am going to look for these to try out. Oh my stars, now I am starving!! Haven't had breakfast yet and this soup just did me in! Gorgeous! I am so glad you joined us and shared this beautiful recipe during #SundaySupper. Gorgeous. Italian flavors in a soup, oh I love it! The meatballs are perfect for it! This is my kind of food! Fabulous photos Jennifer! Lovely photos! I almost always have a reserve of meatballs in the fridge. This recipe sounds and looks great! oh, yum! I feel as if I'll be making #SS soups all week--and I hardly know where to begin! I haven't tried frozen meatballs...I will get the ones you recommend and try them with this soup recipe because it sounds just so good (and comforting too). I keep heading my head on my computer screen trying to smell the oregano, basil, and garlic in this beautiful soup. Will be looking forward to your meatball recipe. This soup looks wonderful. Pasta, tomatoes, and meatballs = comfort in a bowl. I seriously cannot wait to try this delicious looking soup. You're making my mouth water. Yum! Pinned. What a comforting dish, love it! I'm a sucker for pasta and adding it to a soup looks delicious. Yummy Jen! 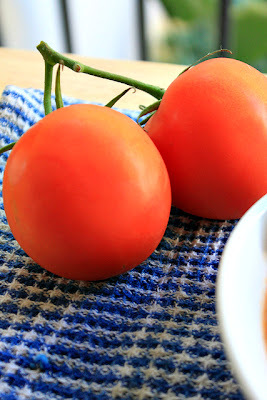 Perfect first #SundaySupper post :) Beautiful photos too! Oh my gosh, is it bad I just want to high board dive right smack into the middle of the bowl. This is beautiful. I can almost smell it. Oh yum, what a perfectly comforting bowl of soup. Love the frozen meatball shortcut, and the little toasts look so perfect on the side. This sounds wonderful! I will have to make it soon! Thanks for sharing. Seriously, your photos are so beautiful, I wanted to jump in and eat your soup! Thank you so much for sharing. I know my family would love this. Oh, this is heavenly! I swear I must be part Italian - I adore Italian food!! Love this soup! Can't wait until the weather cools off a bit so I can try it. 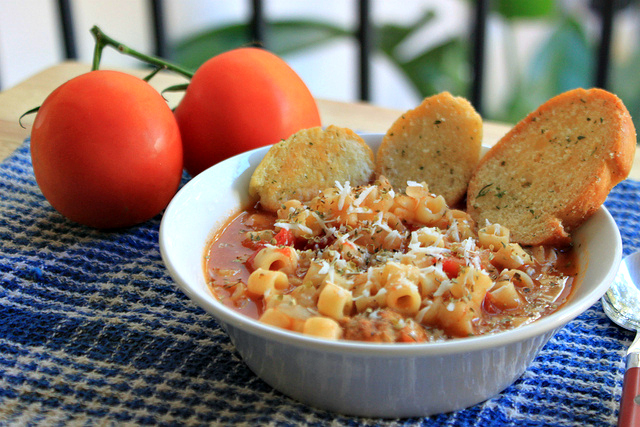 I love an Italian flavored soup with pasta and agree it's perfect comfort food! This recipe would also be a perfect contribution to the Shine Supper Club (our theme this month is pasta). Hope you'll join us. Just finished this! Loved it!! Hubby even liked the kick it had. I made my own meatballs, WOW...thanks for sharing! Yummy! 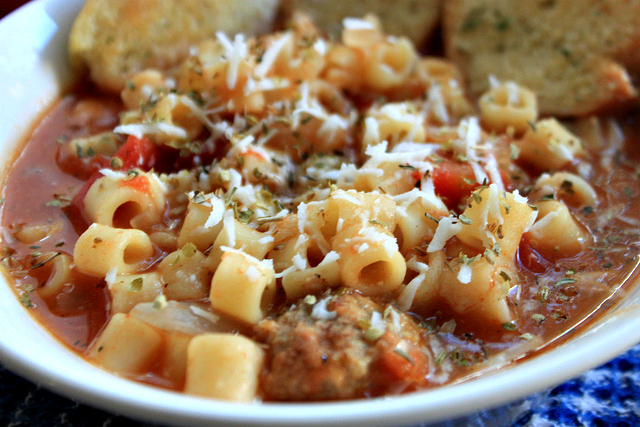 Looks awesome :) I love Italian flavors and pasta especially in my soups! yum. Wow this soup looks amazing - thick and rich - just how I like em! Definitely saving to my recipe file! Nothing like a good bowl of soup to bring comfort...this sounds lovely! I like the word ditalini. It's such a cute word. And this soup looks amazing. I love a good soup in the fall. Nothing makes you feel more warm and cozy than a bowl of great soup. Pasta too but you have pasta in the dish so you covered all your bases. I have recently fallen in love with Ditalini pasta! I love it in everything and this soup is just beautiful! Pinning it now! This puts me in mind of a tomato based Italian Wedding Soup (which I totally love!) It looks really yummy! ooh ! This looks so good ! Feel like diving right in :) Yummm ! Love the blue towel. Adds a touch of warmth ! I wish I had a giant bowl of this right now!